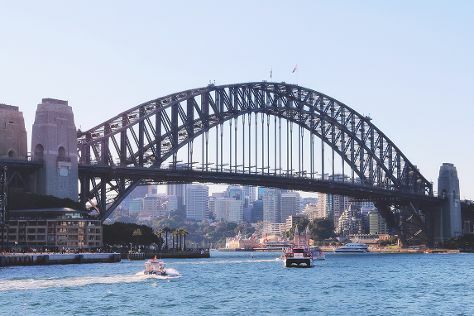 On the 2nd (Tue), admire the natural beauty at Royal Botanic Garden Sydney, then catch a live performance at Sydney Opera House, then snap pictures at Sydney Harbour Bridge, and finally wander the streets of The Rocks. Get ready for a full day of sightseeing on the 3rd (Wed): kick back and relax at Bondi Beach, admire nature's wide array of creatures at Sea Life Sydney Aquarium, and then wander the streets of Darling Harbour. The Route module shows you travel options from your home to Sydney. In July in Sydney, expect temperatures between 21°C during the day and 9°C at night. Finish your sightseeing early on the 3rd (Wed) to allow enough time to travel to Cairns. Start off your visit on the 4th (Thu): see some colorful creatures with a scuba or snorkeling tour. Keep things going the next day: indulge in some personalized pampering at some of the best spas and then explore and take pictures at Hartley's Crocodile Adventures. To find where to stay, reviews, traveler tips, and tourist information, use the Cairns trip itinerary planner . Traveling by flight from Sydney to Cairns takes 6 hours. Alternatively, you can drive; or take a train. Expect somewhat warmer temperatures when traveling from Sydney in July; daily highs in Cairns reach 30°C and lows reach 20°C. Wrap up your sightseeing on the 5th (Fri) early enough to travel back home.